Three Alberta Health Services’ employees are being recognized as Women of Vision among the 2018/2019 honorees of Global News in Edmonton. Dr. Michiko Maruyama, left, is an aspiring heart surgeon, visual artist and toy maker. Paramedic Veronica Ryl champions resilience and has developed critical-care skills to help her EMS colleagues. Marni Panas, program manager of Diversity and Inclusion, is a transgender woman who promotes a safer, more inclusive workplace. EDMONTON — It’s been a banner year for a trio of Alberta Health Services trailblazers, all named Global News Women of Vision, whose achievements and ability to inspire others garnered three of the broadcaster’s monthly awards for 2018-2019. Aspiring cardiac surgeon Dr. Michiko Maruyama, paramedic Veronica Ryl and diversity champ Marni Panas joined other Edmonton-area honorees at a sold-out evening of celebration, song and inspirational stories at Edmonton Convention Centre on April 4. Bursaries and scholarships are also awarded to help other young women realize their vision. Life is a creative fusion for Dr. Michiko Maruyama. She’s a fourth-year cardiac surgery resident at the Mazankowski Alberta Heart Institute, and also an accomplished painter, illustrator and toy designer. She’s on a mission to change how people experience medicine through her art. Her dual nature stems from her days as an industrial design student, followed by medical school, where she also did daily doodles to represent what she learned that day. “So I have a passion for medicine. So I have a passion for art. So I do medical art.” Today, her doodles have become books, and her artworks are on display across Canada and the U.S. In fact, it inspired her to create paper models of the organ — something she calls ‘organ-ami’, a specialized kind of origami — which she uses to help children understand their medical conditions and to engage them in the excitement and artistry of constructing them. Her relentless can-do attitude comes from knowing how precious a day can be, and her battle with a rare form of cancer that, at one time, left her fearing she might lose her left leg. She also created a card game, Doctors Against Tragedies — inspired by Cards Against Humanity — to raise awareness of the perils of fentanyl and opioid use, with future editions in the works to address topics such as infectious disease, sexual health and social media safety, all under a non-profit umbrella. Human resilience never fails to fascinate Veronica Ryl, who knows well from personal experience that paramedics, EMS and first responders face a daily battle not to be overwhelmed by the dire scenes they witness in their life-saving roles. For some, keeping up a resilient spirit can make all the difference between sustaining their career — or falling prey to post-traumatic stress disorder (PTSD). “I think that resilience has been coming into the spotlight for the last few years within the first-responder community and rightfully so,” says Ryl, who’s served in EMS for 12 years. “We’re seeing more evidence and more literature on the importance of it. To support her colleagues here and abroad, Ryl teaches courses to foster their critical-care skills and resilience. As well, she’s expanded her role in the Edmonton community at large to better serve the mental health of her fellow citizens. “CREMS is our mental health team. A paramedic is paired with a mental health therapist — that could be, like, a social worker, a psychologist, they wear many hats — so we go and see patients in the community, referred to us by either EMS or the police, to help people in mental crisis. Marni Panas, program manager of Diversity and Inclusion, fosters both at Alberta Health Services. A leading voice on inclusion and social justice, she’s dedicated to creating safer and more inclusive spaces for sexual and gender minority (LGBTQ2S+) and all diverse people. She’s also actively engaged in the advancement of legislation and policies to support human rights both provincially and federally. As a transgender woman, Panas has always been open about her personal journey in the hopes of helping others and promoting acceptance through education and respectful dialogue. 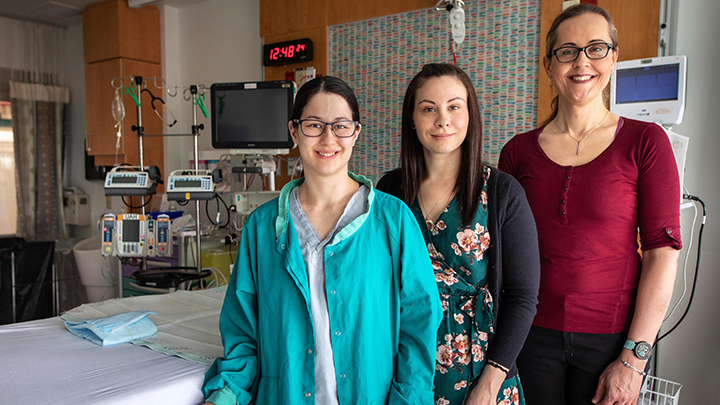 “Most of the important things that have come about in my life have been because of my connection with Alberta Health Services — both as a parent of two really sick twin babies, to being a patient myself, and to working here and being part of the AHS family. So many of the gifts that I have in my life have been because of these things. “I’ve shared in the story myself, as part of my gender transition, a big part of my life that happened because I worked here — because I worked with people who were truly in the business to care for each other, our patients and their families. I knew that if I couldn’t do it here, I couldn’t do it anywhere. “What I said in my speech at the Women of Vision event was that, for 40 years of my life, it’s like I’ve been a flickering ember — and all of a sudden I was given this oxygen that has turned into a bonfire with all the warmth and energy and light — and I’ve been really able to shine. And that’s what I’ve felt in recent years at AHS since my transition. See video interviews with Marni Panas, Dr. Michiko Maruyama and Veronica Ryl. Other Global News Women of Vision honourees for 2018/2019 include: Annette Loiselle, SkirtsAFire Festival; Bean Gill & Nancy Morrow, ReYu Paralysis Recovery Centre; Cecile Bukmeier, NAIT Autobody Technician; Rosella Bjornson, Canada’s 1st Female Airline Pilot; Chau Lui, Paris Jewellers; Audrey Poitras, President of The Metis Nation of Alberta; Marcy Mydlak & Carol Olivieri, Blue Kettle; Shirley Benson, District Chief of Edmonton Fire Rescue Services; and Stephanie Bach, Vertical Farming Scientist.